Also in the court is one Filippo Lombardi, 21. The Italian Roma fan has admitted the offence of violent disorder but denies wounding or inflicting grievous bodily harm. The trial continues, as does Mr Cox’s ordeal. Liverpool midfielder Naby Keita was stretched off the pitch in the Reds’ 1-0 Champions League defeat by Napoli. Keita was taken to hospital in Naples. He “underwent a number of precautionary health checks”, says the Liverpool official website. So what’s wrong with Keita? “It is his back,” says Jurgen Klopp, the Liverpool manager. And then the speculation began. Liverpool fans’ website Empire of the Kop says “Keita might have paid the price” for Napoli’s pitch, which they say was “really poor and nowhere close to being appropriate for a top-level game”. The Mirror says he “caught” his foot on the “rough” playing surface. But Keita has a history of back problems, having missed some of Liverpool’s pre-season tour to the United States last July after aggravating an existing back problem on a flight. Why blame Napoli? Naby Keita went to hospital after a heart problem scare during the defeat against Napoli. One moment you’ve a bad back, the next they’re carrying you off to the morgue. Such are the facts. Compare and contrast the Daily Mirror’s stories today on Cristiano Ronaldo and the FIFA Best awards. Ronaldo was up again for the top gong he won last year and the year before that. This time he was against Real Madrid’s Luka Modric and Liverpool’s Mohamed Salah. Who won? Modric did. He’s been brilliant for Real and Croatia. The Mirror’s reporting has been less than great. The Portuguese played for Juventus at Frosinone on Sunday night , and has another fixture for his new club at home to Bologna on Wednesday. Cristiano Ronaldo delivered a telling reminder of his greatness just before the Best FIFA Awards. On Monday, Ronaldo will be suited and booted and on his way to the Royal Festival Hall on London’s South Bank. So he will be there? News that Arsenal rejected Virgil van Dijk, 27, before Southampton bought him comes as no great shock. The final years of Arsene Wenger’s leadership at Arsenal are punctuated with a myriad bad decisions and indifferent coaching. The BBC says Arsenal could have bought the now Liverpool star for £12m from Celtic but thought him “too nonchalant”. He was presumably all those thing when Celtic bought the Dutch national captain from Groningen for £2.5m. He did well there but it was at Southampton where he flourished. And what Collins does not say is how well he was coached at the innovative south coast club. Southampton’s system has produced Gareth Bale, Calum Chambers, Theo Walcott, Alex Oxlade-Chamberlain, Adam Lallana and Luke Shaw. And players have improved at the Saints: Saido Mane, Nathaniel Clyne, Dejan Lovren (all now at Liverpool) and Toby Anderweireld. Name one academy player who really improved under Wenger in his final four or five years at Arsenal, or a new recruit who looked like a bargain. It’s not easy. Southampton also have a Black Box Room, modelled on the aviation industry, so that they can constantly analyse the data from training and matches, just as aviation learns from the cockpit recorders. The analysts are striving to build better metrics to improve recruitment, despite the statistical challenges. They have studied a number of outside organisations, including Google. Would Van Dijk have gotten that development at Arsenal under Wenger? No. Southampton (plus a dash of Liverpool desperation on paying such huge fee) turned him from a decent player into the world’s most expensive defender. 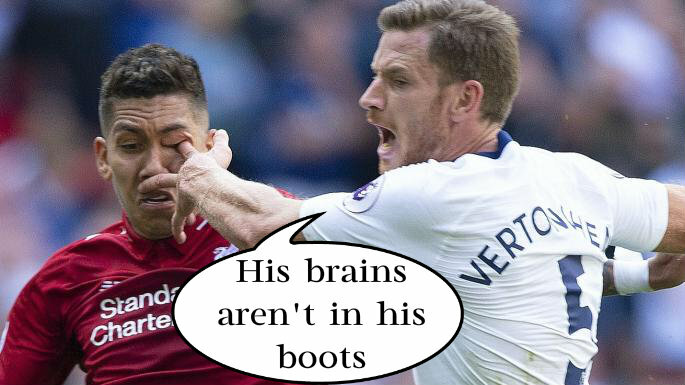 As Spurs lost 1-2 at their adopted Wembley home to Liverpool, many people noticed the moment when Tottenham’s Jan Vertonghen appeared to massage Roberto Firmino’s brain. Did he mean to do it? Gouging usually involves the thumb. Fingers are used to gain purchase on the target’s head. But here Vertonghen leads with the index finger on his favoured left hand. The risk of a long finger nail or one coated in Shellac coaxing Firmino’s eyeball from the socket cannot be overlooked. And there’s the position of Vertongen’s middle finger, pressed as it is below Firmino’s nose in a kind of ‘smell this’ gesture. Add a touch of banter from the Spurs man (“Hand ball!”) and you’ve got a full on assault of the senses. PS: In rugby union the minimum punishment should be 12 weeks, according to the laws of the game. In 2016, Tottenham midfielder Mousa Dembele was banned for six games after appearing to gouge the eye of Chelsea’s Diego Costa. Liverpool to play in Levi’s jeans? When Liverpool players aren’t shaving their chests and rubbing Nivea into the stubble, expect to see them sliding on pairs of Levi’s jeans. Levi’s are Liverpool’s “official denim partner”. It’s a big deal for mankind. Be in no doubt. The club says Liverpool FC and Levi’s are “two organisations dedicated to making a difference around the globe”. Cynics might wonder if playing football in jeans is the way forward? The current fashion is for footballers to pull their sock up high like stockings over their knees and tether them possibly with garter belts under the hem of their big skort-style shorts. It’s a small step to wearing trousers, or A-line skirts. But this is about “giving back to fans through football, lifestyle and music”, it says hear. Fans no longer care about winning cups and having a laugh at the match; they come to Anfield for tips on skin care, yoghurt and if carrot-cut denim can lead to deep vein thrombosis in quieter matches. The plan is for the Levi’s LFC “capsule collection”. We look to it with excitement, as must too rival clubs keen to link their brand with fabrics. Arsenal velvet perhaps, Spurs chiffon or Manchester City oilskin? You can’t even laugh at a footballer’s failure these days. No sooner had Liverpool’s 25-year-old German goalkeeper Loris Karius made a delicious hash of his side’s Champions League final match against Real Madrid than the medics pronounced him concussed. Karius wasn’t rubbish when it mattered most. He was a victim. And that’s worse. When Karius was a calamity ‘keeper, we could relate to him. He was human. Time would heal the fans’ disappointment and his sense of regret. One day he’d pretend not to save something and become that most rare of things: a German the country loves. He’d explain how it all went wrong and produce a string of great saves to show that having reached the nadir the only way was back up. We will see that the Champions League final was a freak event that adds texture to a career it does not define. If Gareth Southgate can recover from missing a crucial penalty at Euro 96, Karius can rise again. You don’t get to be Liverpool’s first choice without displaying some degree of talent and skill. The clangers would be out of kilter in the video montage of a terrific life between the sticks, the two big non-saves adding a layer of interest to any autobiography. But when doctors in Boston assessed him a few days after defeat to Real, Karius’ became a man beyond redemption. Something had gone wrong that nothing could ever fix. You can’t laugh at concussion and self-deprecate. You can’t move on because what happened is defined as something beyond your control. Lured into victimhood, Karius tis tipped to leave the club. Liverpool have paid an absurd sum to recruit Brazil international Alisson, 25, as the club’s new number one. Karius can sit on the bench and wait or hope another big club wants him and go. But who wants a victim? No humour. No chance of salvation – unless he believes in his own agency. To take delight in another’s failure is part and parcel of football. In Karius’ world, we should not celebrate the opposition’s red card, own goal or error. We should hold hands and form a prayer circle. Karius evokes god. And the divine Mohamed Salah, his brilliant Liverpool’ colleague, damns him, tweeting: “Stay strong Karius. It has happened to the best players. Ignore those who hate.” The problem is that you, Karius, and neither God nor Mo is the last line off defence. It’s not we who need to learn from our mistakes. It’s not us who needs to rediscover our nerve. It’s you. Liverpool will sign Alisson, the Roma and Brazil goalkeeper, for an eye-watering and absurd £66.8m. Alisson, 25, has only been at Roma for two years, joining from Brazilian side Internacional for €8 million. Thanks to Liverpool’s desperation to recruit a decent keeper, Alisson will become the world’s costliest stopper, beating the €53m Juventus paid Parma for Gianluigi Buffon in 2001. So it is goodbye to Loris Karius, the hapless 25-year-old German. He’s not a bit crap (see Champions’ League final) – he’s a little concussed (see Champions League final). Goalkeepers are the subject of today’s transfer news round-up. It turns out that Liverpool will not be sticking with Loris Karius, who, as the BBC puts it, was “found” to be suffering from concussion when he gifted Real Madrid two goals in the Champions’ League final. Cynics suggested the discovery of Karius’s concussion might be part of a plan to keep his stock high when it comes to flogging the hapless German. That view was boosted by his performance against Preston when the 25-year-old German “spilled a free-kick” that allowed the hosts to score in Liverpool’s 3-2 win. There was tabloid talk of Liverpool sticking with Karius, backing the man and who cannot be blamed for his medical plight. But then Liverpool tabled a £62m offer for Roma’s Brazil goalkeeper Alisson. Last time Liverpool went shopping in Rome they brought back Mo Salah. Can they strike gold with Alisson? And will they get him? News from Italy is that Chelsea want Alisson, a pursuit linked to Real Madrid’s intention to sign Thibaut Courtois, 26, for £31m. Should Chelsea fail to get Alison, the Blues will move to re-sign 36-year-old Czech goalkeeper Petr Cech from Arsenal or Leicester’s Kasper Schmeichel, 31. As Luka Modric prepares for his move to Liverpool (source: Daily Express clickbait factory), he can look forward to playing with Jordan Henderson and his Croatia teammate Devran Lovren, self-declared “one of the best defenders in the world”. Lovren t0ld BeIN Sportsafter a Modric-inspired Croatia had overcome England: “I took Liverpool to the final of the Champions League and now with my national team we are in the (World Cup) final. I think people should recognise that I am also one of the best defenders in the world and not just talk nonsense.” He said that “without being arrogant”. As football fans the world over watch Lovren highlight tapes (and the rest of us roll our eyes and look at Mo Salah) the rest of can look back at how Modric, Ivan Rakitic and Marcelo Brozovic bossed the midfield, barely letting Jordan Henderson, Jesse Lingard and Dele Alli touch the ball. The England players’ limitations were baldly exposed by the Croatian midfield that grew stronger as the game went on. No Englishman was less influential than Henderson. Some kind soul has illustrated Henderson’s contribution with a “Regista” compilation of the Liverpool man’s lumpen passing. Jordan Henderson vs Croatia WC 2018. 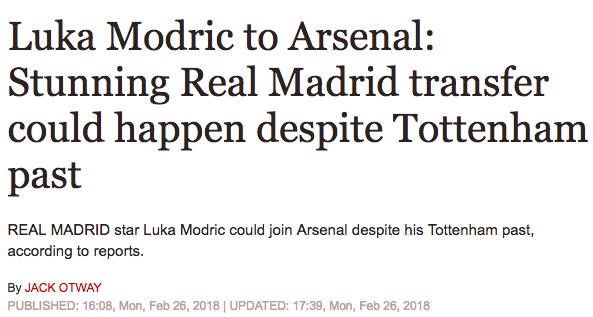 A headline is an opinion, which is why the Daily Express can call Croatia’s brilliant midfielder Luka Modric a “Spurs flop”. 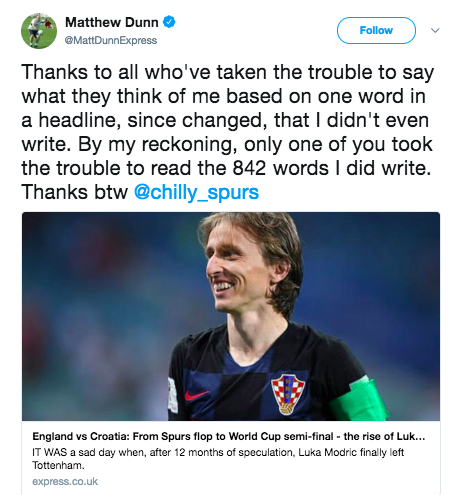 The full headline used to seduce readers to click on the paper’s story runs: “From Spurs flop to World Cup semi – the rise of Luka Modric.” Total balls, of course. Modric was great at Spurs. He joined Spurs on April 26, 2008 for around £17 million. He was good enough to attract the attention of Chelsea – who offed £40m for him – and Real Madrid, who signed Modric for a fee in the region of £30m. “Luka has been a terrific player for us and, while we preferred not to part with him, we are pleased that it is to Real Madrid, ” said Tottenham chairman Daniel Levy. At Real, Modric has been instrumental in the club winning the Champions League four times in the last six seasons. Modric is likely to leave Real Madrid at the end of the season with the Croatia international’s form waning this season… And Spanish website Diario Gol say the veteran could make a stunning move to Arsenal. It is claimed Real will offer the player a new deal. But that will only be until 2020 and Modric, who feels he can play at the top level for many more years, may want a longer contract. He may. He may not. That is where United can intervene. However, whether Real allow another key asset to leave the club remains to be seen. More shameless tosh in the Express every day. All that guff about Cristiano Ronaldo returning ‘home’ to Manchester United is over – well, it is until his four-year contract with Juventus ends, at which point the British Press will doubtless rekindle the story of the then 37-year-old fulfilling his ‘dream’ move to Old Trafford. At Juventus, Ronaldo will earn around £73,000 a day at Juventus, plus the huge fee he earned as part of the £99.2m transfer fee that prised him away from Real Madrid. The shiny one is due another huge payday should he sign a deal allowing Facebook to broadcast a 13-part reality show on on his depilation techniques and other key life moments. Facebook will pay £9m to watch and report on Ronaldo’s every waking moment. This is about £9m more than the rest of us get to have Facebook spy on us. As Ronaldo buffs Turin, more big moves are expected to follow. Former Real Madrid and England manager Fabio Capello says Juventus’s Argentine striker Gonzalo Higuain, 30, is now a dead cert to leave for Chelsea. 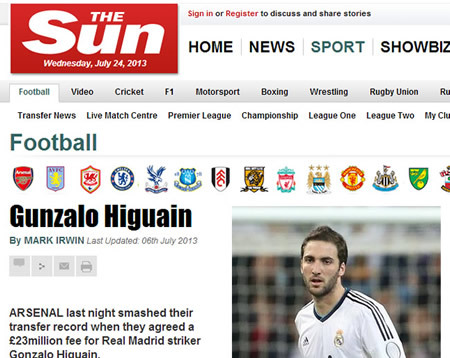 There are no such things as done deals until the deal is done, of course, something the Sun nows only too well, it having reported Higuain’s move to Arsenal (a story that still sits as fact on the paper’s website). And Liverpool will offer £80m for Juventus’ Argentine forward Paulo Dybala, 24. The Reds have the cash but why would Juve sell their two star strikers? There’s also a lot of talk of Chelsea’s Eden Hazard, 27, moving to Real Madrid. Chelsea are in a state of disarray. So the sensible thing would be to sell their best player, right? The pesky fact is that Mingolet was more fan than player in the match, appearing for not a single second of action. He didn’t even play when Belgium dropped nine first team players for their match with England, the Belgians preferring to stick with Thibaut Courtois. In other news: Loris Karius is the Liveepool Number 1. This summer’s transfer saga centres on Nabil Fakir’s move from Lyon to Liverpool. The transfer was so far progressed that Fakir was filmed wearing a new Liverpool shirt. But the £52m transfer (£48m plus extras) collapsed amid Liverpool’s concerns over the state of Fakir’s knee – the player suffered a bad injury to his knee in 2015. Can it be that Fakir, who has had a very ordinary World Cup on the France bench, is now off to Manchester United? 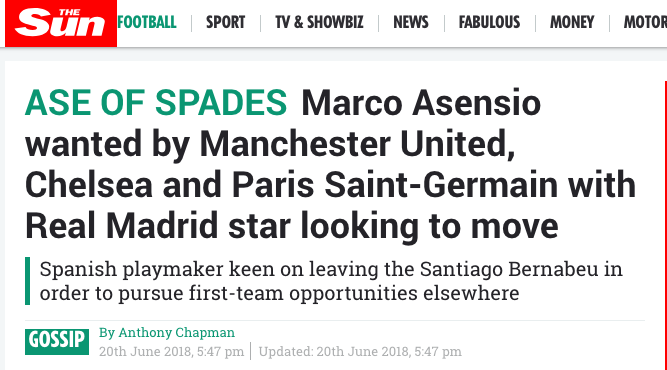 In “Man Utd transfer news” the Express reads Aulus’s words and conjures the story: “Why Nabil Fekir is likely to snub Liverpool for Manchester United.” As the Express reads Fakir’s mind, the Mirror goes with: “Nabil Fekir could be forced to choose between Manchester United and Liverpool if he leaves Lyon.” Eurosport goes further. “United pounce for Liverpool target Fakir,” it yells. The Fekir tales are probably just that and there is no concrete evidence United want him. He only has two years left on his contract, so Lyon would prefer to sell the 24-year-old this summer while he is coveted by a big Premier League club, rather than in a year’s time when his value will have dwindled. Clubs have previously fabricated United’s interest in a player to smoke out a bidder and the biggest sucker for the ruse tends to be Liverpool. Hard cheese on any Liverpool fans hoping for an upgrade on goalkeeper Loris Karius, whose errors cost the reds so dear in the Champions’ League final. The Sun says Liverpool manager Jurgen Klopp has given up on signing Roma’s Alisson Becker and wants Karius to remain as his number one. Karius “made two horrendous mistakes” as Liverpool lost to Real Madrid in the Champions League final, says the Sun. It was “his calamitous Champions League final where he gifted Real Madrid two goals”. At no point does the Sun mention the claim that Karius was suffering from concussion. Is that an oversight? 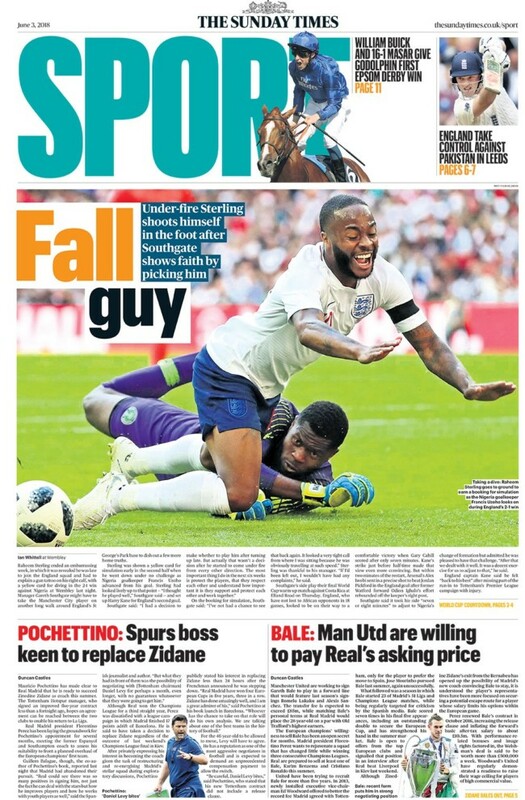 The Mirror adds: “Karius’s errors in the Champions League final had appeared to highlight the Reds’ need for a new man between the sticks.” Again no word on any concussion. Why is it that something so serious as concussion is now dismissed? The Sun once thought it serious enough to explain Karius’ injury in full and advise its readers to go to hospital if the’ve suffered a bang to the head. “The effects usually only lasts up to a few days or weeks,” said the paper, “although in severe cases sufferers will need emergency treatment and can be left with longer-lasting symptoms. It’s all balls, anyhow. Because Sky Sports notes: “Liverpool’s may see long-term target Alisson pinched from under their noses, with Chelsea planning a £65m offer for the Roma goalkeeper.” Can you pinch something the victim never owned and doesn’t want, according to the Sun and Mirror? Transfer balls round-up now, readers, as Liverpool are linked with a £158m move for Real Madrid’s Marco Asensio. The Guardian says Asensio, 22, has “refused” to rule out any move. This usually means the player said nothing on the matter. But the player who signed a six-year contract with Real last September – it has a £442m buyout clause – did speak. When asked at a press conference if he was heading to Liverpool, Asensio looked perplexed and replied: “When the World Cup is over, we’ll talk about that sort of thing.” But according to Metro, Asensio is to hold “crunch talks” with Real Madrid. Should it not go to plan, Liverpool will splurge a massive wedge of cash on the midfielder who played a full minute in the Champion’s League final. 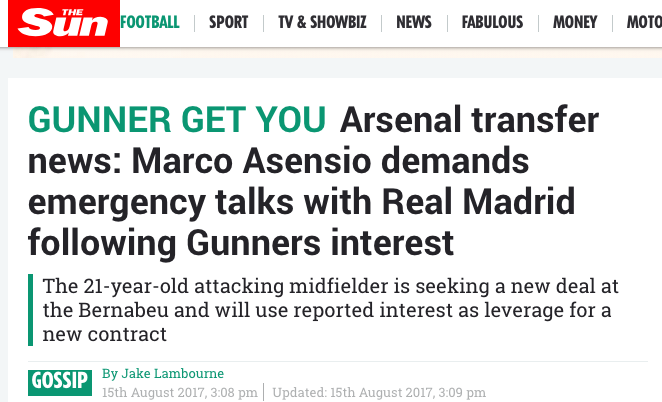 The guff about Asensio leaving the glory for Real to play for Arsenal worked. He scored a great new longterm contract. This latest story of Gotze to Liverpool is rooted in the players words on the DAZN documentary Being Mario Gotze. Gotze left Dortmund for Bayern Munich in 2013. He made the reverse trip in 2016, picking Dortmund over Liverpool. Churn that through the journalism mincer and the Metro can declare: “Mario Gotze drops Liverpool transfer hint and reunion with Jurgen Klopp.” “Mario Gotze still keen on reunion with ‘world-class’ Jurgen Klopp,” says Goal.com. “Liverpool transfer news: Mario Gotze talks up reunion with former manager Jurgen Klopp,” yodels The Independent’s clickbait factory. Liverpool are confident of completing the marquee signing of Mario Götze this summer with the World Cup winner understood to be keen on a reunion with Jürgen Klopp. Liverpool are favourites to sign Gotze, says the Express – because, er, Gotze, who turned Liverpool down in 2016, says Klopp is a good coach. 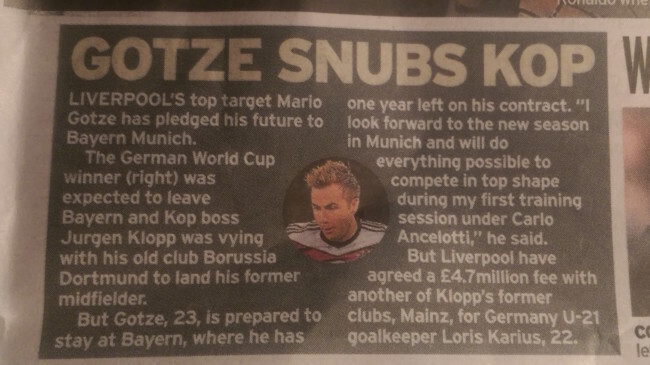 Liverpool should not want Gotze says the Liverpool Echo. Liverpool and Arsenal both want Gotze says the Star. The Metro’s news that Gotze wants to play in the Premier League is a “boost” to Arsenal but, oddly, not a boost to Everton and West Ham. The Guardian just wonders if the Gunners will sign him. They don’t know. Arsenal will play Chelsea on 4 August in a pre-season rubber in Dublin as part of the – get this – International Champions Cup (ICC). Neither club is the Premier League champion. Other Premier League clubs in the competition are: Manchester City, Manchester United, Tottenham and Liverpool. The so-called ‘Big Six’ are all in the ICC to play one another in the same month as the PL season proper begins. When you know the other teams in this marketing campaign are Real Madrid, Barcelona, Sevilla, Atletico Madrid, Juventus, Inter, Roma, PSG, Borussia Dortmund, Bayern Munich and Benfica it becomes clear that the whole thing is a precursor to some European Super League. It boasts the two largest crowds in U.S. soccer history, the only Clásico ever played on American soil and a list of former champions as regal as any tournament in the world: Real Madrid, Manchester United, Juventus, Paris Saint-Germain, Inter Milan, Barcelona. A roster of top scorers that includes Cristiano Ronaldo, Zlatan Ibrahimovic, Luis Suarez, Neymar, and Franck Ribéry. This year, it includes 18 of the world’s most iconic and influential clubs, 90 out of 100 of the world’s top-ranked players and all eight of the UEFA Champions League quarterfinalists. How long before the European Cup final is played in the USA or China? It’s the International Champions Cup, the summer’s biggest club competition, and its mix of megastar glamour and debutante mystery is as compelling a proposition as the game has to offer. Want more of this tosh? The ICC, now in its sixth edition, is a crucial component of the soccer calendar for both the game’s luminaries and its next generation of stars. It’s been a launching pad for numerous emerging standouts over the years. Christian Pulisic—aged just 17—scored an injury-time equalizer for Borussia Dortmund against Manchester City in 2016. American Julian Green registered a hat trick against Inter Milan that same summer, just weeks after his twentieth birthday. Sergi Roberto, then a Barcelona reserve, scored the decider in Barça’s 2015 win over the Los Angeles Galaxy in front of 93,000 at the Rose Bowl. Roberto Firmino, Sadio Mané and Ousmane Dembele each took their ICC opportunity to announce themselves as global footballing forces, and Marcos Asensio—perhaps most famously—did the same by finishing off a stunning end-to-end move to score for Real in Miami’s spectacular 2017 Clásico. It is utter balls. These are brand-building matches played after the the World Cup before the teams’ domestic seasons begin. The only point of it must be the get us used to an elite league of European sides. No News – Breaking! France forward Nabil Fekir is not joining Liverpool. Fekir will remain at Lyon. Fekir was supposed to join Liverpool for 60m euros. He even wore the Liverpool shirt in readiness. But he not signed a contract to join the Reds. Nothing has happened. It’s no news news. “Although Liverpool has been the priority of a possible transfer of Nabil… Olympique Lyonnais is delighted to be able to count on the presence of their captain in 2018-2019,” say Lyon. As said, Lyon fans must be chuffed to know their captain wanted to leave. Liverpool fans will wonder why the club wasted so much time chasing a player who dreams of playing for Barcelona. Liverpool have not signed Nabil Fakir for £53million. News is that the Reds stalled after the Lyon took his medical with the club. 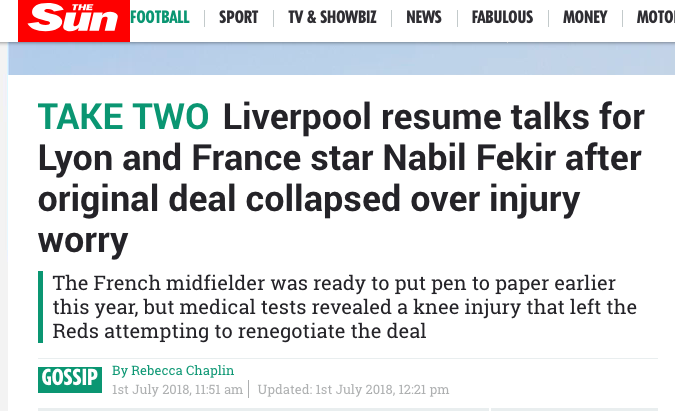 Fekir performed media duties in a Liverpool strip, says the Mirror. And then nothing happened. Lyon’s fans must be delighted to hear that their captain has been wearing another club’s shirt. And since when has £53m bene not enough for a talented but not out-of-this-world player? Over in today’s Daily Mirror, we are told: “Fekir has been identified as the marquee signing of the transfer window, and a natural replacement for Philippe Coutinho.” A marquee is a large tent. Like us, we got as far as “understood”, the word that means sod all in the world of clickbait football reporting. “Understands” is shorthand for “maybe or “maybe not”. But he wants to play for Liverpool. that much is understood and indicated. Or as he said: “My favourite club is Barcelona. But I need to work a lot, I am aware of that.” If he plays well enough at Liverpool, he may yet achieve his dream of playing in Barcelona. All hail the new Coutinho, then. 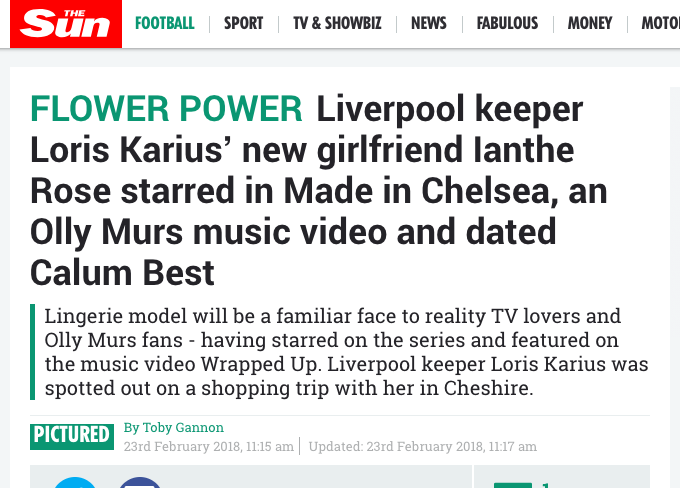 Yet another “exclusive” in the Daily Star, which brings news of Liverpool goalkeeper Loris Karius. 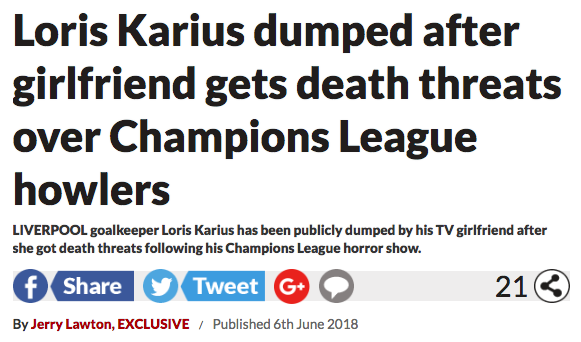 He’s been “dumped after girlfriend gets death threats over Champions League howlers“. Before we get to Ianthe Rose Cochrane-Stack, for it is she, a bit of background. Karius played a pivotal role in Liverpool’s 3-1 defeat to Real Madrid in the Champions League final. 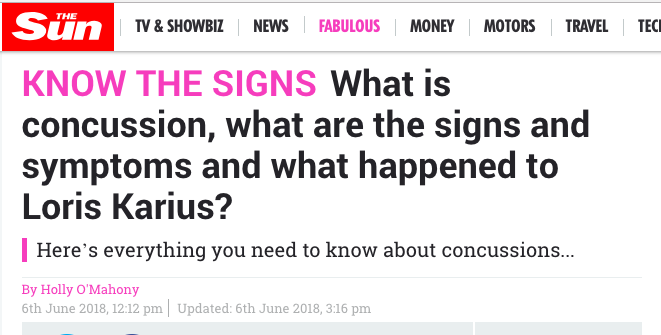 The current theory is that he was suffering from concussion. In the Times, Matthew Sayed, who earlier said Karius erred because he’d been focusing too hard and missed a big Frenchman standing a foot from his shoulder, now says Real’s Sergio Ramos “had driven his elbow into the jaw of Loris Karius”, something backed up by “video evidence”. It isn’t. All we see is two players colliding. We don’t know if that collision led to any concussion – indeed, we don’t know for certain if concussion caused Karius to keep goal with less composure than a man shouting on the night bus or Joe Hart. The medics at the US hospital who checked Karius did so five days after the match at Liverpool’s behest. Michel D’Hooge, chief executive of Headway, the brain injury association, says he can “imagine” concussion was at the root of Karius’s hapless performance. But he can’t be certain. No-one can. Ianthe Rose Cochrane-Stack revealed trolls had threatened to stab her after his bungles cost his team two goals in last month’s 3-1 defeat by Real Madrid. The Made In Chelsea beauty was photographed with Karius just weeks ago. But she has now moved to distance herself from the shamed stopper by posting on social media that she has been single for a year. The sight of his mother staring into middle distance, looking away from the game while it was still going on as she held his sobbing girlfriend prompted Klopp’s wife Ulla to move a few rows and try to offer some reassurance. At the end of the game, while Karius lay on the floor the three women – all of them connected by the desperation of it all – stood there, wrapped in each other’s arms. A: Liverpool lost the Champion’s League final with Real Madrid because Mohammed Salah injured himself and Loris Karius is useless. B: Liverpool lost the Champions League final because Real Madrid defender Sergio Ramos chucked Salah to the ground with a judo-style throw and collided with Karius’s face, causing the Egyptian to leave the field of play and the goalkeeper to lose his bearings and let in two soft goals. So he speaks and everything is magnified. “I see the play well, he grabs my arm first and I fell to the other side, the injury happened to the other arm and they said that I gave him a judo hold,” says Ramos, getting in the sympathetic back story. “After that the goalkeeper said I dazed him with a clash,” he adds. Karius went to Massachusetts General Hospital in the USA – a place where Liverpool owner J Henry has co-chaired a fund-raising campaign. The hospital says Karius most likely suffered concussion during the match. His two clangers that cost Liverpool two goals in a 3-1 defeat were the result of a brain injury? He’s not rubbish. He’s dazed and confused. Ramos talks about himself in the third person. Karius, if the medics are to be believed, likely sees both of them at once. Salah has had surgery for his injured shoulder. He might not play for Egypt in the World Cup. We have received numerous calls today regarding the health status of Liverpool goalkeeper Loris Karius. With Mr. Karius’s permission, we are providing information about his medical situation in an effort to prevent, where possible, the dissemination of incomplete or erroneous information. On May 31, 2018 Mr. Karius underwent a comprehensive examination by Dr. Ross Zafonte and Dr. Lenore Herget in Boston at Massachusetts General Hospital and Spaulding Rehabilitation Hospital. After carefully reviewing game film and integrating a detailed history – including his reported present and immediate post-contact subjective symptoms – physical examination and objective metrics, we have concluded that Mr. Karius sustained a concussion during the match May 26, 2018. At the time of our evaluation, Mr. Karius’s principal residual symptoms and objective signs suggested that visual spatial dysfunction existed and likely occurred immediately following the event. Additional symptomatic and objectively noted areas of dysfunction also persisted. It could be possible that such deficits would affect performance. We also note that Mr. Karius has reported significant and steady improvement since the concussive event, and we expect him to make a full recovery based on the results of the examination. We expect that with treatment and by following prescribed activity protocols he will continue to improve. We have encouraged vigilance and an emphasis on safety in his eventual return to full activity. This is the only comment we will be making in relation to this matter. 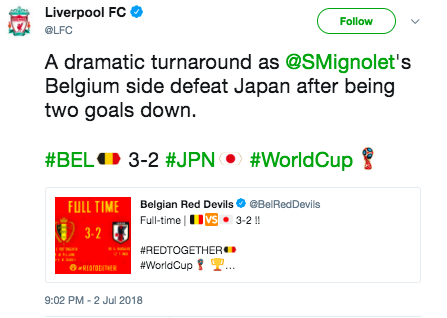 All future media inquiries should be directed to the Liverpool FC Press Office. Not all that conclusive, then. Concussion is a serious thing. Unfortunately, the harm of these concussions extend beyond the field. I suffered severe headaches, bouts of anxiety and depression, and balance problems, which all contributed to my falling weeks behind in my pre-med studies. As I think about this sad trend, I am struck by two things. The first is the lack of convincing research regarding concussion prevention. … I am also bothered by the lack of consequences for the opposing players who commit fouls that cause concussions. While referees are instructed to “protect the goalkeeper,” neither of the players who gave me my concussions had any sort of meaningful consequences, despite the fact that both were flagrant fouls where neither of them made any contact with the ball. While their team merely lost possession of the ball, I was losing my soccer career. Real Madrid have abandoned their pursuit of Tottenham manager Mauricio Pochettino, says Guillem Balague. The European champions made Pochettino their number one target following Zinedine Zidane’s decision to quit on Thursday. However, the lack of a release clause in the Argentine’s contract, coupled with the prospect of dealing with Tottenham chairman Daniel Levy – who proved a tough negotiator for Real in the transfers of Luka Modric and Gareth Bale – resulted in them ending their interest. The Spurs manger was recently talking about Real Madrid on a trip to Spain where he’s plugging his new book, Brave New World: Inside Pochettino’s Spurs – by Guillem Balague! Pochettino told Radio Marca in Spain that Daniel Levy “bites“. And now Balague says Levy has scuppered any hope Poch had of managing Real. Coincidence? Klopp is only mentioned because a poll of Real Madrid fans has Klopp as the one most of them would like to be the club’s next manager. The Express fails to say where this poll was conducted. We found out that it was conducted by Marca, the Spanish newspaper two days ago. The German received 29 percent of the votes in a MARCA poll… This placed him ahead of the second favourite Mauricio Pochettino, who had 23 percent, while Castilla coach Guti was just behind on 20 percent. Joachim Low claimed 14 percent, while Michel had nine percent. The only other option on the poll was for none of the above, which took a share of five percent. It was a poll of 6 choices. how many Barcelona fans voted for Klopp is not stated. Arsenal are using Borussia Dortmund as a feeder club, chasing the German side’s former star Ousmane Dembele. The Gunners want the forward to play with his former teammates Pierre-Emerick Aubameyang and Henrikh Mkhitaryan. Ex-Dortmund chief scout Sven Mislintat is now head of recruitment at the Emirates. The Gunners have offered Dortmund £16m for their 29-year-old centre-back Sokratis Papastathopoulos. What’s he going to say when he joins Arsenal? And where were Arsene Wenger and the Arsenal scouts when Dembele joined Dortmund from French side Rennes on a five-year deal in May 2016 for £13m? Liverpool also want him. Sky says former Dortmund manager Jurgen Klopp “will attempt to meet Dembele’s mother to help convince the player his future lies at Anfield”. Dembele’s mother Fatimata “is who will decide Ousmane’s future,”, says the player’s agent.